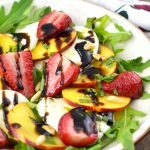 Roasted strawberries, sweet peaches, and delicious mozzarella cheese are sprinkled with mint, toasted pine nuts, and balsamic glaze. It’s fresh, light and perfect for summer. If you haven’t tried roasted strawberries then you’re missing out, these babies are so sweet and delicious and can be eaten with sweet or savoury dishes. Try roasted strawberries with salad, ricotta bruschetta or dolloped on top of a large scoop of vanilla ice cream. I love Caprese salad, it’s so simple and with good quality, fresh ingredients it tastes incredible. I decided to give the classic Italian salad a sweet twist with strawberries and peaches and it’s SO damn delicious. I can tell I’ll be eating this all summer long, it’s so fresh and light which is a must on hot summer’s days and it’s bursting with wonderful summer flavours. 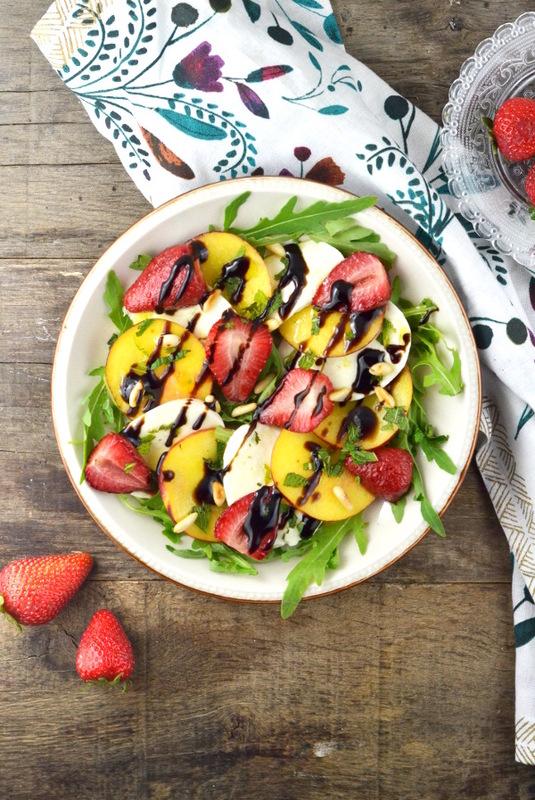 The roasted strawberries caramelise slightly in the oven and go perfectly with the soft, mellow mozzarella cheese and tangy balsamic glaze. The peaches give a wonderful sweetness to the salad and the toasted pine nuts provide texture and nuttiness. This summery caprese salad only takes 10-20 minutes to make, it’s that simple. Cut the tops off the strawberries and cut them in half, drizzle in a little oil and toss into a lined baking tray. Roast the strawberries for 10 minutes until soft. Meanwhile finely slice the peaches and mozzarella, chop up some mint leaves and toast the pine nuts in a dry frying pan under a medium heat for a couple seconds until golden. All that’s left to do is assemble the salad. I like to add a small handful of arugula/rocket to each plate then place alternate slices of peach and mozzarella on the plate followed by the juicy strawberries. Finish with a sprinkling of chopped mint, pine nuts and a drizzle of olive oil and balsamic glaze. Enjoy for a light lunch on a hot summer’s day! If you’ve tried this or any other recipe on the blog please let me know how you got on in the comments below, I love hearing from you! You can also FOLLOW ME on FACEBOOK, TWITTER, INSTAGRAM and PINTEREST to see more delicious food and what I’m getting up to. 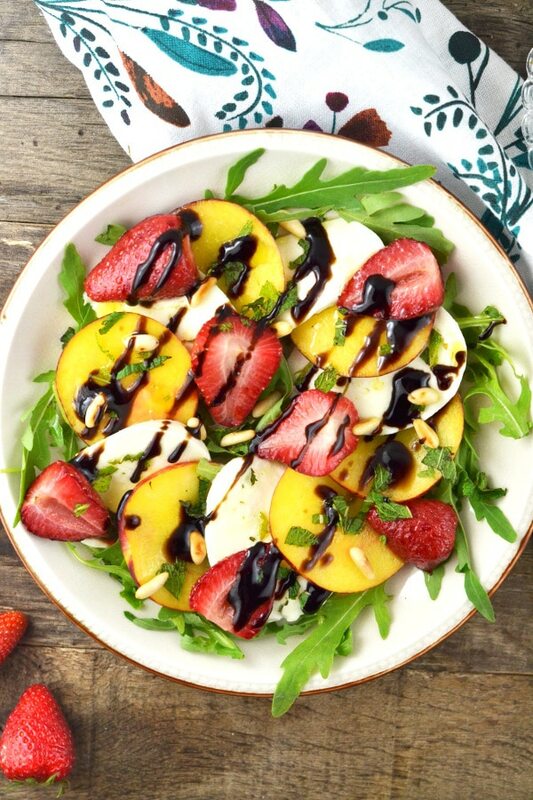 Roasted strawberries, sweet peaches, and delicious mozzarella cheese are sprinkled with mint, toasted pine nuts, and balsamic glaze. It's fresh, light and perfect for summer. Preheat the oven to 180°C/350F/gas mark 4. Cut the green tops off the strawberries and slice in half. Drizzle in 1 tsp of olive oil, toss to coat the strawberries then add to a lined baking tray, sprinkle with a tiny pinch of salt then roast in the oven for 10 minutes, until soft. Let cool slightly. Add the pine nuts to a small dry frying pan under a medium heat and toast until golden brown on each side, set aside. Finely slice the peaches and mozzarella and finely chop the mint leaves. To assemble the salad, place a little arugula/rocket on each plate then add alternate slices of peach and mozzarella on top. Top with the roasted strawberries, a sprinkle of chopped mint and pine nuts. Add a drizzle of olive oil and balsamic glaze over the salad and serve. Recipe can be doubled to serve 4. Ciao, I'm Emily! I have a passion for all things Italian; the culture, language, and food. So much so that I live here in beautiful Tuscany. Experience and taste authentic and traditional Italian food as I share it with you. Roasted strawberries are unbelievably good. 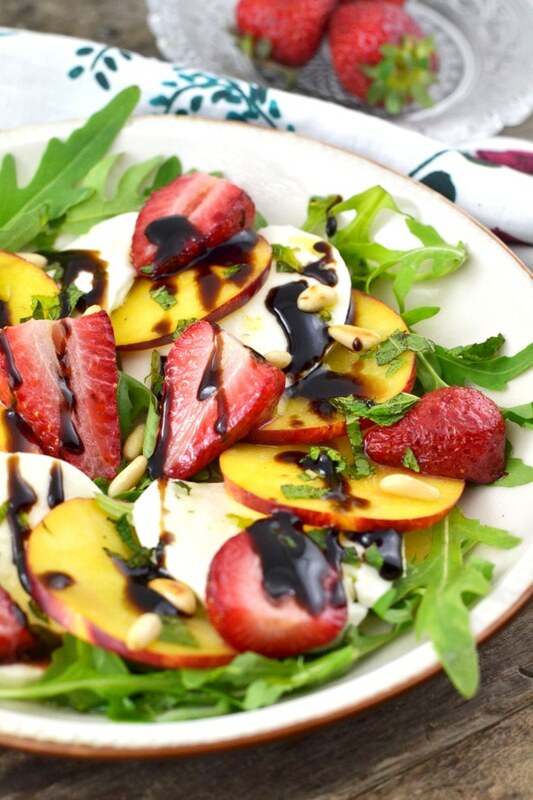 Love your fruit spin on classic Caprese Salad. This is a perfect summer salad. Aren’t they, I love them. Thanks so much Jackie! I haven’t tried roasted strawberries yet but putting it on my things-to-try-soon list as this salad is exactly my cup of tea 🙂 It has all my favorite ingredients. You had me at roasted strawberries! This salad looks delicious, can’t wait to try it. Thanks so much Michelle, I hope you like it. I can’t wait for peach season! I love roasted strawberries but must try them with balsamic glaze. Love this recipe! I’ve never roasted strawberries – clearly I must! What a delightfully colorful salad – perfect for a hot summer day or even just because. Thank you Shashi, it’s my favourite summer salad.